1.4 oz package. 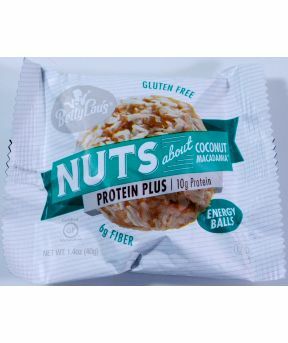 Protein plus/ 10g protein, 6g fiber, gluten free. Ingredients: Organic agave syrup, protein blend (why protein isolate, pea protein isolate, whey protein concentrate), cashew, inulin (dietary fiber), whey protein crisps (whey protein isolate, whey protein concentrate, tapioca starch, calcium carbonate, sunflower lecithin), coconut, rice bran, macadamia nuts, natural flavors, arabic gum, sea salt, guar gum, safflower oil, vanilla extract, mixed tocopherols (natural vitamin E). Allergens: Contains milk, tree nuts (cashew, macadamia, coconut), and traces of tree nut (almond, pecan). Good manufacturing practices are used to segregate ingredients in a facility that processes other products, which may contain peanuts, tree nuts, wheat (gluten), milk, soy and/or eggs.